Polarization (Social sciences); United States; History; 21st century. Party affiliation; United States; History; 21st century. Political parties; United States; History; 21st century. Debuting in its first edition, The Polarized Public takes an in-depth look at the seemingly irreconcilable divide between Republicans and Democrats and argues that bi-partisanship remains elusive, not because of politicians in the capitol, but because of the American public and their fixation on party membership and loyalty. How did this intense polarization develop? How has it influenced the current political climate? How will it evolve and affect the upcoming presidential and congressional elections? Alan Abramowitz addresses all of these questions among others in this new, eye-opening addition to The Great Questions in Politics series. 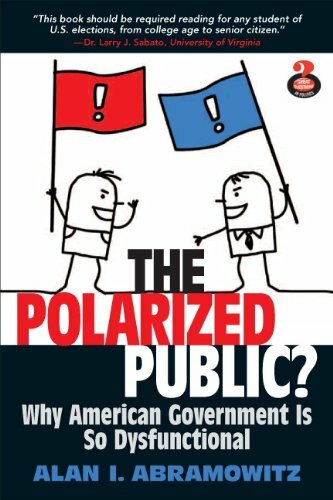 About: Debuting in its first edition, The Polarized Public takes an in-depth look at the seemingly irreconcilable divide between Republicans and Democrats and argues that bi-partisanship remains elusive, not because of politicians in the capitol, but because of the American public and their fixation on party membership and loyalty.